Menu: After your first time, you need a quick and simple sauce, try this puttanesca. And if you’re like me, you will also need wine in order to accomplish making homemade pasta, so wine and lots of it! In a large bowl, mix together the flour(s) and salt. 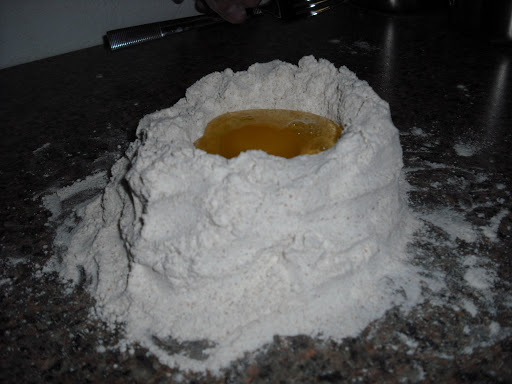 Pour onto large surface (with enough room for kneading) and gather into a large mound. 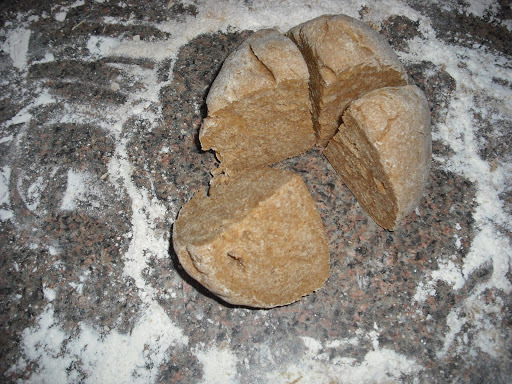 Knead the dough on a lightly floured surface until the dough is stiff and elastic, usually for a good 5 minutes. 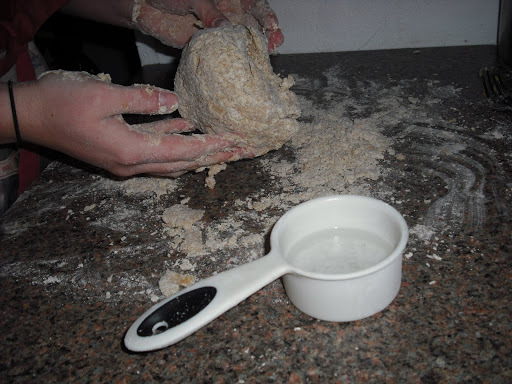 You might need to add more water if the dough is too hard to knead; or more flour is it is too wet. Cover, and let stand for 30 minutes to relax. 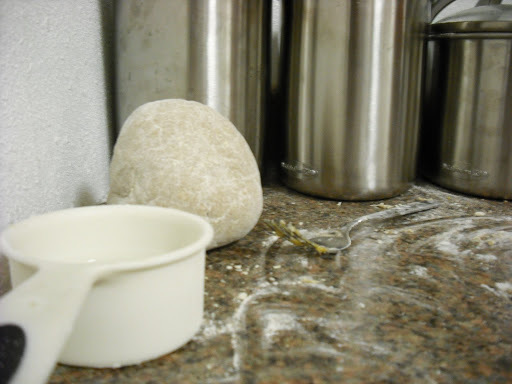 Cut the dough ball into quarters, flour what was the inside of the dough ball and flatten the section. 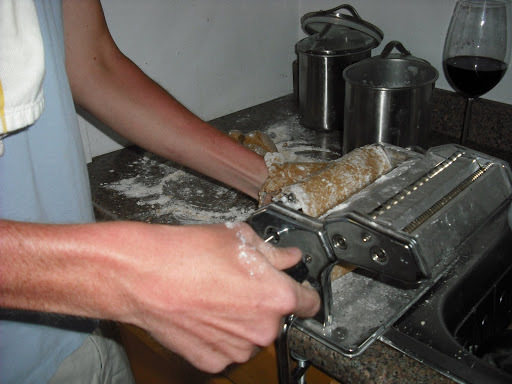 Dust the pasta machine with flour as well. Start with the largest setting (7 on my machine) and begin to roll. I usually roll it a couple times in the largest setting and then move down by twos. Each section will roll into a long sheet. (Roll to lowest setting for angel hair, second lowest for spaghetti, and so on). Place rolled pasta sheets on towels until all pasta has reached desired thickness. Next, cut the pasta to desired shape (use maching for angel hair, spaghetti, linguine, fettuccine, etc. or hand cut into parpadelle). 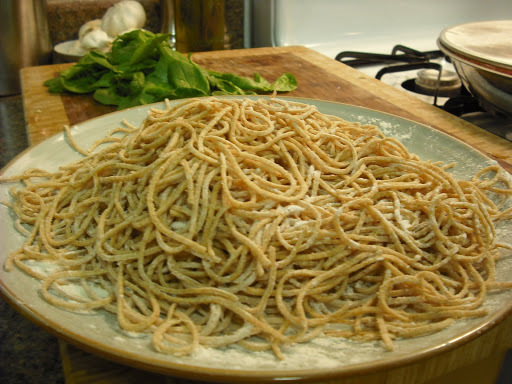 Place the cut pasta on a floured platter and add flour each layer to prevent the pieces from sticking together (see photo from above). Have a salted pot of water boiling and add pasta as soon as you’re done. The pasta will only take 3 – 4 minutes. (Seriously, it seems to cook almost instantly so pay attention!) Remove from pot and serve immediately.